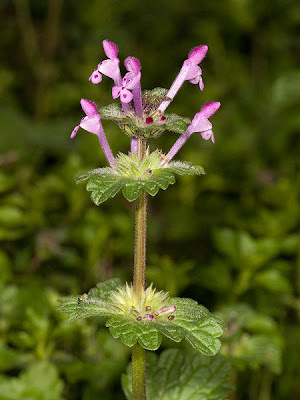 Sometimes going by the name Henbit, but also going by the name Deadnettle, both Henbit Deadnettle - Lamium Amplexicaule and Purple Deadnettle - Lamium Purpureum grow all across the entire United States. 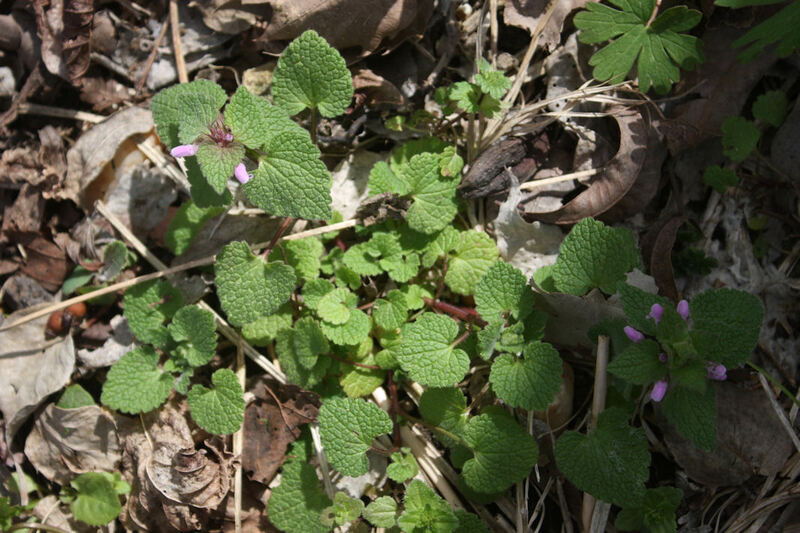 Henbit (L. Amplexicaule) covers the entire U.S. and in our local area is far more common than the Purple Deadnettle (L. Purpureum) which is also called Archangel Red Dead-Nettle. 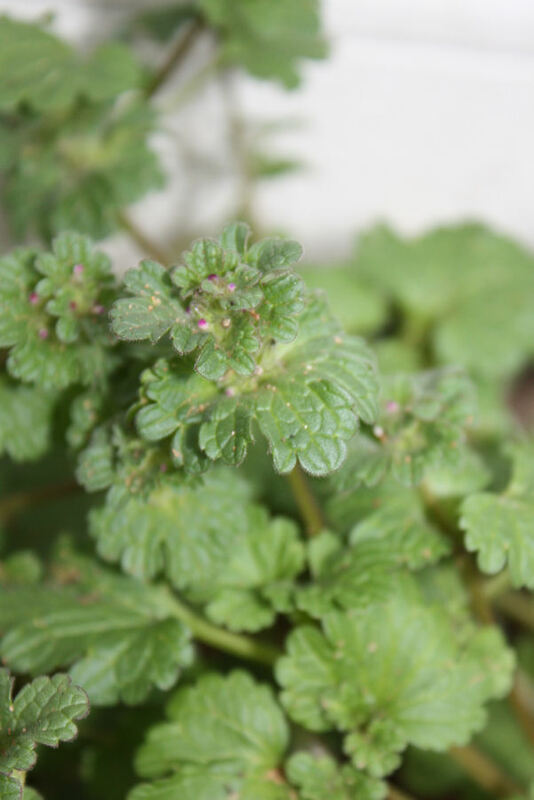 Henbit is most certainly also called deadnettle because it is just one species of at least five (5) in the Deadnettle (Lamium) genus growing in the United States. They fall under a large family of plants called the Mint (Lamiaceae) Family. Henbit usually grows in great clusters, clumps or what some would call matts, anywhere from an inch or so tall to five or more inches. Here you see it growing between the cracks in these brick outside of my garage. You'll see it many times in disturbed planters, roadsides or other areas. Its shape makes it hard to miss. Both species that grow in the southeast, the L. Amplexicaule and the L. Purpureum are both completely edible and can be eaten raw or cooked in salads or in anyway you might cook a vegetable. 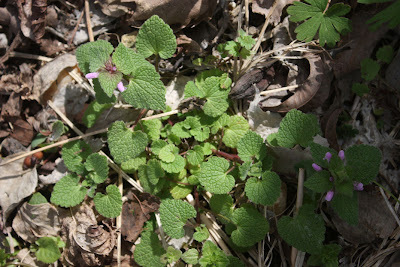 Above you will see some of the differences between Henbit Deadnettle and Purple Deadnettle. It seems to tolerate cold weather quite well. You will see it mostly in the late fall, winter and spring but especially in the winter months and spring when there are less plants competing with it. Right now there are plenty of wild onions and garlics visible growing in the yard. All of them fall into the category of the "onion" (Allium) genus, which covers well over 100 different species ranging from onions to garlics to leeks and ramps. We have to be very careful not to get it confused with other members of the Lily (Liliaceae) Family however because many of them are toxic or even poisonous. A good rule of thumb is that if it has a bulb AND smells like an onion or a garlic then it is edible. If it is a bulb and you can't really smell a strong onion or garlic smell when you bruise the leaves, bulbs or individual cloves, then it is not an onion or garlic and you should not eat it. 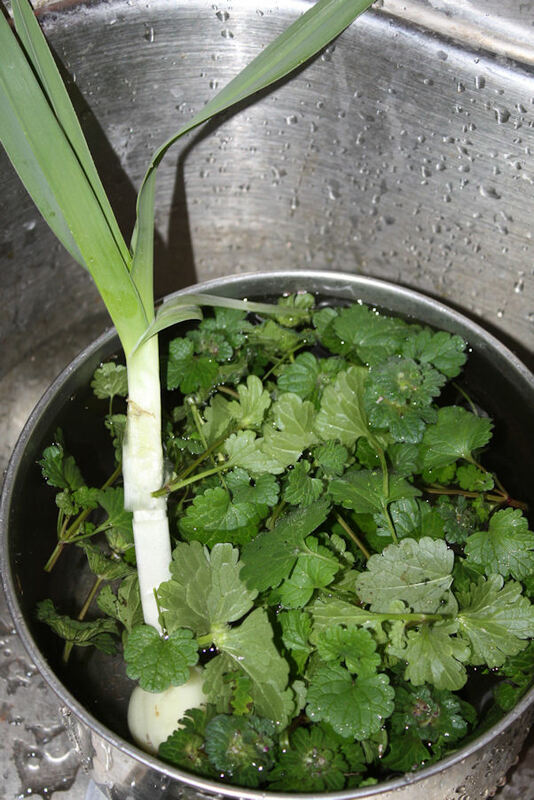 I just happened to be lucky enough to find what I know to be some wild garlic based on the smell and taste outside of my well house. 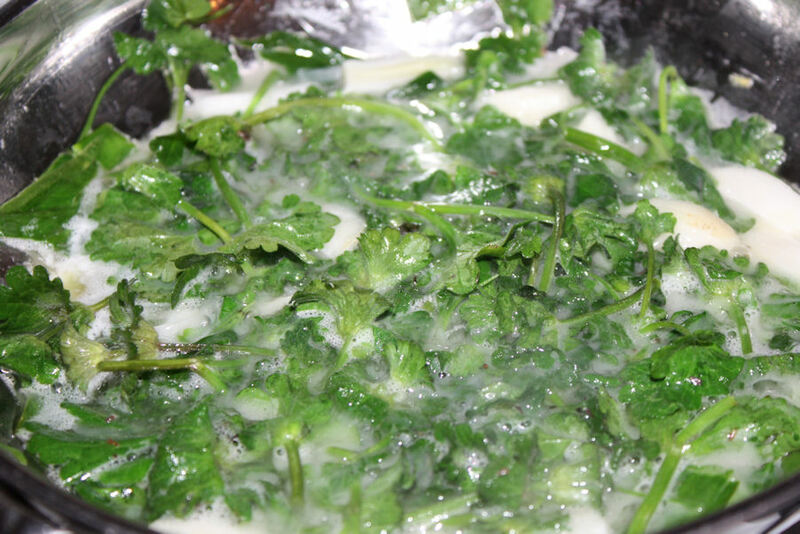 After cleaning it well, I cut up the leaves and the bulb and placed it all in a pan with some butter and olive oil. Turning the gas burner on "medium" it did not take long for the butter to melt and the henbit greens to cook down. I did not have to add either salt or pepper. Even the stems were tender cooking it this way. 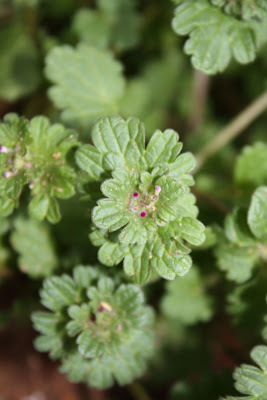 The thing about henbit however is that prior to cooking the leaves are sort of rough, sort of like mustard greens, so a thorough washing in water is required to remove any sand or grit. Doing so will make your experience much more pleasant. I did add quite a bit of garlic as you can see above. 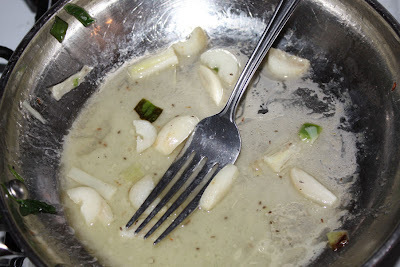 The funny thing is that I do not like to eat onions or garlic straight out. I enjoy the flavor of onions and garlic, but not the onions themselves. This much garlic might be a little strong for some tastes, but as you can see, the henbit didn't even make it into a plate because I ate it right out of the pan as I was cooking it. Last year I boiled some and it tastes rather good that way, but not near as good as the way I cooked it tonight. Maybe it was the butter or the garlic or both, but whatever the case it competes successfully with any green. 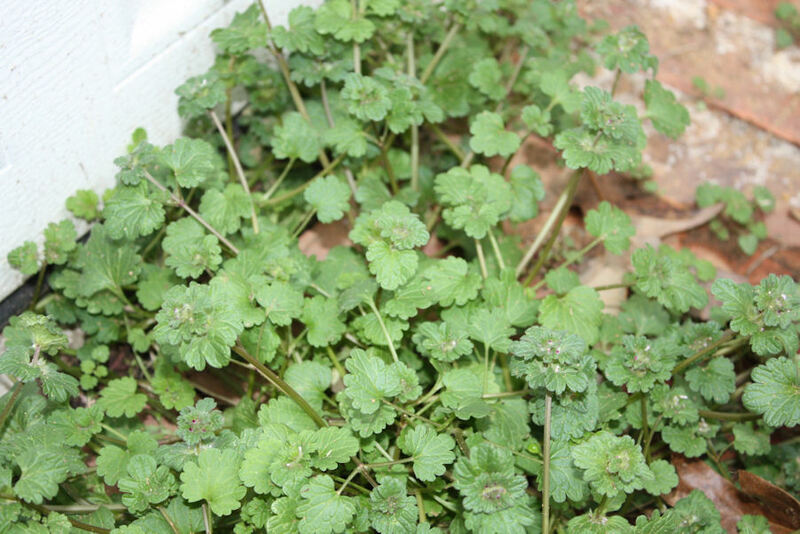 Henbit can be eaten raw on salads as well, but it certainly is not my favorite that way. It has a course texture when raw, which disappears when cooked above. Boiling still leaves a little texture but helps tremendously. This "weed" grows in great abundance around these parts and is popping up everywhere now (January) so it should not be difficult for you to find some if you are in a mood to try something different and experiment. Good luck to improving your foraging and cooking skills.